Confusion of Confusions - IFA Vintage and Current Book Library - Index Fund Advisors, Inc. The Confusion of Confusions: Between Speculation and Eschatology, Paul Held, Univ. of CA, Santa Cruz. - Financial Classics - The classic masterpiece by Josseph de la Vega finally in a unique English adaptation. This Seventheen century masterpiece is the oldest book ever written on the stock exchange business. Taking the form of a dialogue between a philosopher, a merchant and a shareholder, it describes the workings of the Amsterdam stock exchange, the first stock exchange ever created in the world. Josseph de la Vega was a gifted and prolific writer, a merchant and an intellectual, who maintained a lively correspondence with a number of sovereigns and other pre-eminent contemporaries. In Confusion of Confusions , the reader is confronted with the many guiles, manners and rules that were represented on the Amsterdam stock exchange. De la Vega's indignation with the excesses he observed around him comes accross as surprising, refreshing and even current in these modern times. 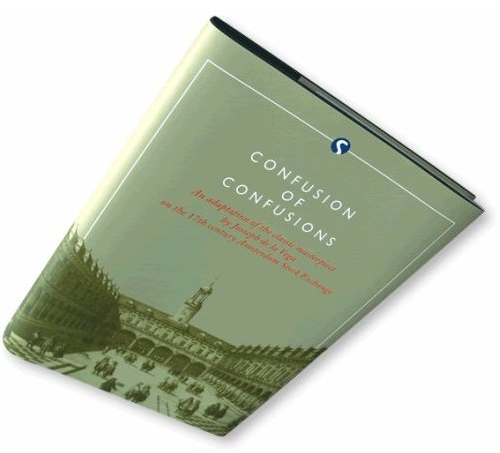 Confusion of Confusions is also the perfect gift for anyone involved in investment banking and the ideal way to pleasantly surprise your clients. Don't hesitate to contact us for bulk orders or for copies of the book showing your company logo on the cover.